I have rocks in my house. Big ones. That might seem strange to most people, but not to show folks. These rocks are going on a Greek holiday soon. Paper mache over chicken wire from Toronto theatre arts teacher Roberta Belfry. They’re dressed as Canadian rocks now. But they will be getting a face lift soon for the Greek island set of Shirley Valentine this spring. These rock stars need to lighten up a bit. But since they’re my roommates for a while, I thought I’d get to know them better. How do prop makers do it? How do they make rocks? It turns out there are a number of different ways. And most methods require one common process: paper mache. That’s papier-mâché for purists. It’s newspaper dipped in paste that can whipped up in your kitchen. Some prop makers prefer a more robust brew of white glue and water. But it works much the same way. Before you mix up your paste, you need a form for your rock. This can be shaped using wood, wire, styrofoam, balloons, or crumpled paper. Dip strips of newspaper in the paste and layer them onto your form. Let it dry. Repeat. Then paint. It’s messy but fun. If your set requires a bigger rock face, similar principles apply. You just need a lot more space. In this video, Philip Stephens makes large cave walls for puppet plays. You can learn how to make just about anything online. Try instructables.com for videos and other guides on prop making. If it’s smaller, more precious stones you’re after, just scale it down. You don’t need a form, just a blender. And lots of soggy paper. Mark Montano shows how adding a little glaze can make fake jewelry sparkle onstage. I don’t even notice the rocks in my living room anymore. They’re part of the furniture. Show folks are accustomed to sharing our space with the odd set piece, costume, or prop in transit to its next show. 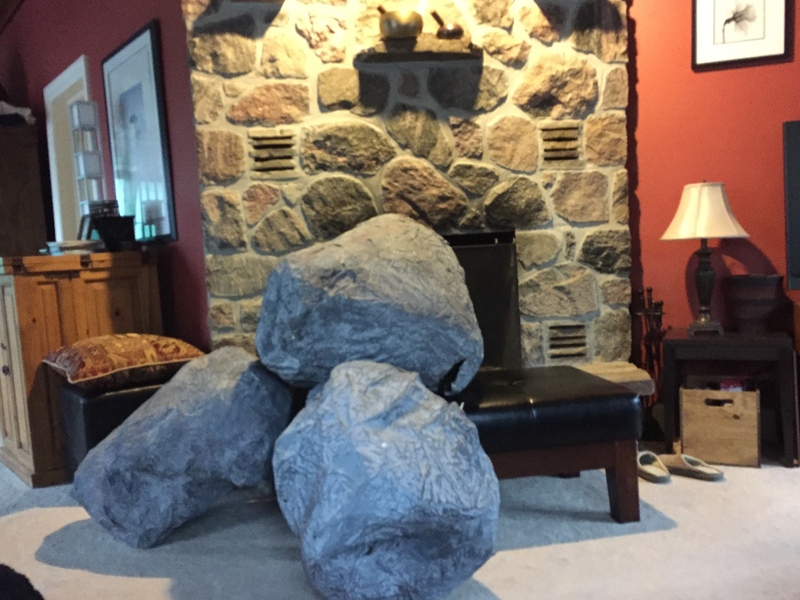 But when the furnace repair guy walked in the other day, I was reminded that not everyone has boulders in their parlours. “Whoa.” I saw him tense up a bit. “It’s okay, they’re for a show,” I explained. I’m sure he thought I had rocks in my head too. Prop master Eric Hart wrote the book on prop making. He offers a helpful list of online resources for theatre and film artists. Be sure to check out his 100 best sites for prop makers.